I took these pictures this afternoon at Warner Park. It was a nice day to spend at the park, it really felt like summer. I made an audioslide show to accompany my story on Wild Warner but I don’t think I can post it to wordpress. A group of passionate Madison north side residents have joined together to preserve and celebrate the wild side of Warner Park. Warner Park, founded in 1962, is Madison’s largest urban park. The park, encompassing just over 200 total acres, features 41 acres of “wild,” untouched land home to numerous birds, foxes, deer, rabbits and other animals and 60 acres of wetland. The story of Wild Warner begins in the fall of 2009 when the city of Madison released a tentative neighborhood plan for the city’s north side. Details of the plan caught the eyes of some nature-loving north side residents. The plan called for numerous changes to Warner Park, including the addition of pontoon boats on the lagoon, a new soccer field, a new parking lot and more sidewalks. 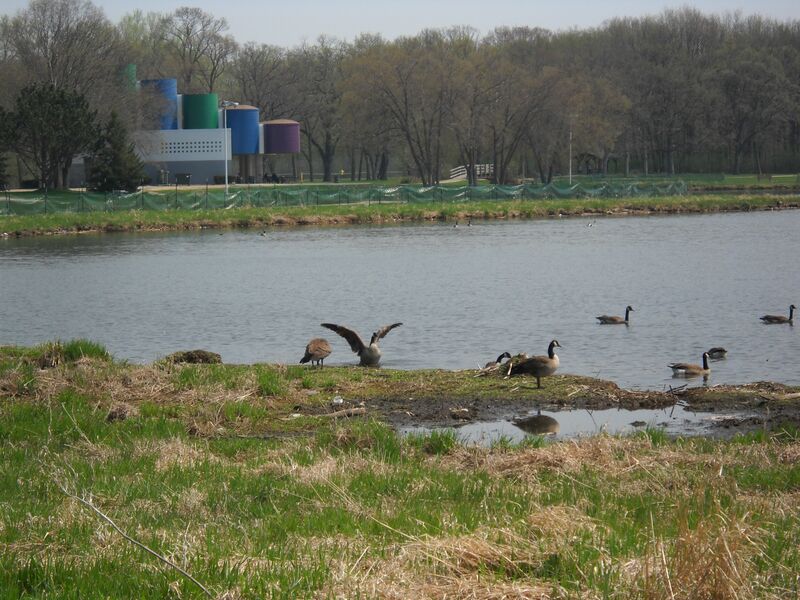 In April 2010, the Parks Commission approved a plan that called for the kill of over 150 geese at Warner Park in order to protect Dane County Regional Airport. 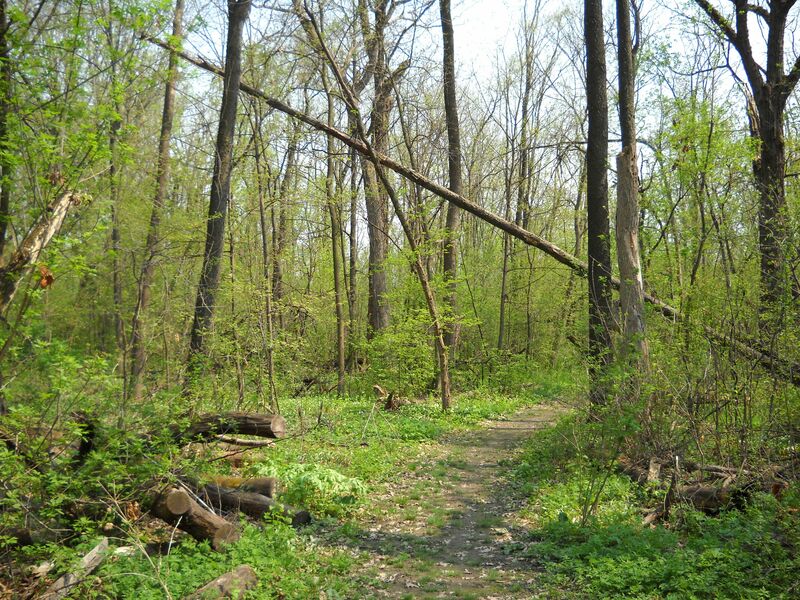 Many people were outraged at the plan, believing that the city had broken their promise to protect nature at Warner Park. In response, a group of north side residents decided in July 2010 to formally create an organization to advocate for the protection of Warner Park’s wild side. “People weren’t respecting the nature and its limitations and no one was speaking for the wild side,” said Wild Warner founding member Dolores Kester. On Aug. 10, Wild Warner became a non-profit corporation. Doing so allowed the group to accept charitable contributions and also helped with grant eligibility. The organization received their first grant of $2500 from the city of Madison last month. Members hope to use the money for a summer community learning project and materials, such as binoculars and magnifying glasses. Jim Carrier, a writer and filmmaker, is the chair and co-founder of Wild Warner. Carrier designed and edits wildwarner.org and leads the group’s monthly meetings. Carrier is pleased with the amount of progress the group has made in its short existence. “We’ve only been around for a small time, I think we’re doing great work,” said Carrier. The group speaks up for Warner Park’s wild side at city council and Parks Commission meetings. They also teach others about the park’s natural areas through events and nature walks, like the April 30 bluebird walk led by Paul Noeldner, an Audubon bluebird expert. A birding club was recently founded at Sherman Middle School by Trish O’Kane, a leading member of Wild Warner and a graduate student at the UW-Madison Gaylord Nelson Institute for Environmental Studies. The “Bird Buddies” study the birds at nearby Warner Park. The middle schoolers spotted the yellow-bellied sapsucker, the 100th different bird species found in Warner Park, last month. 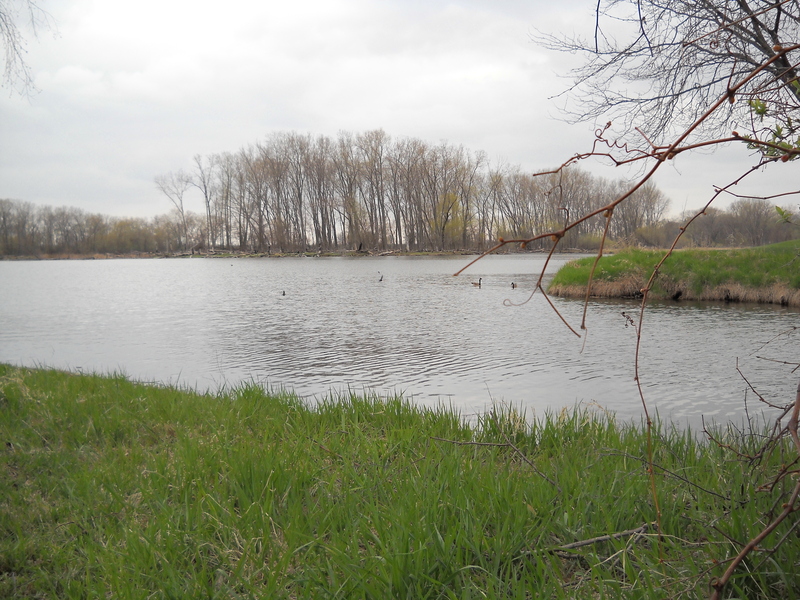 Warner Park is home to 105 known birds species as of May 3, according to O’Kane. The Madison Parks Commission unanimously decided last month that the Cyclo-Cross bike race would not be held at Warner Park in 2011 after members of Wild Warner spoke up in opposition of the race. Last fall, members of Wild Warner worked with organizers of Cyclo-Cross, held on Nov. 7, to lessen the race’s impact on the park’s nature areas. “The Parks Commission finally recognized that we have nature that needs to be preserved. Warner Park is visible as nature to people that didn’t see it that way before,” Carrier said at the Wild Warner meeting held on May 3. A few members of Wild Warner, nicknamed the “geese peeps,” focus on the protection of Warner Park’s geese. The city is in the midst of developing a goose management plan. Throughout the process, Wild Warner has been giving the city advice on how to control the goose population without killing the geese. “We want the park to be an example of humane management,” said O’Kane. Wild Warner’s next step is to expand and become a more formal organization. Nine members attended the May monthly meeting at the Warner Park Community Recreation Center, and according to Carrier, their biggest meeting had just over 20 attendees. The group has an e-mail list of about 50 people. “Right now we’re just a great group of volunteers,” said O’Kane. In recruiting new members, Carrier said he hopes the group can better reflect the north side by becoming more diverse. All nine members who attended the May 3 meeting were Caucasian. Carrier also wants the group to create a develop a charter with some formal rules and regulations. Even at their small size, Wild Warner will continue to fight to preserve the wild side of Warner Park. “I love this park, and I want to preserve it so future generations can enjoy it too,” said Kester. I wrote this story in May 2011 for my advanced reporting class at UW-Madison. I’m covered the Sherman neighborhood of Madison, WI. 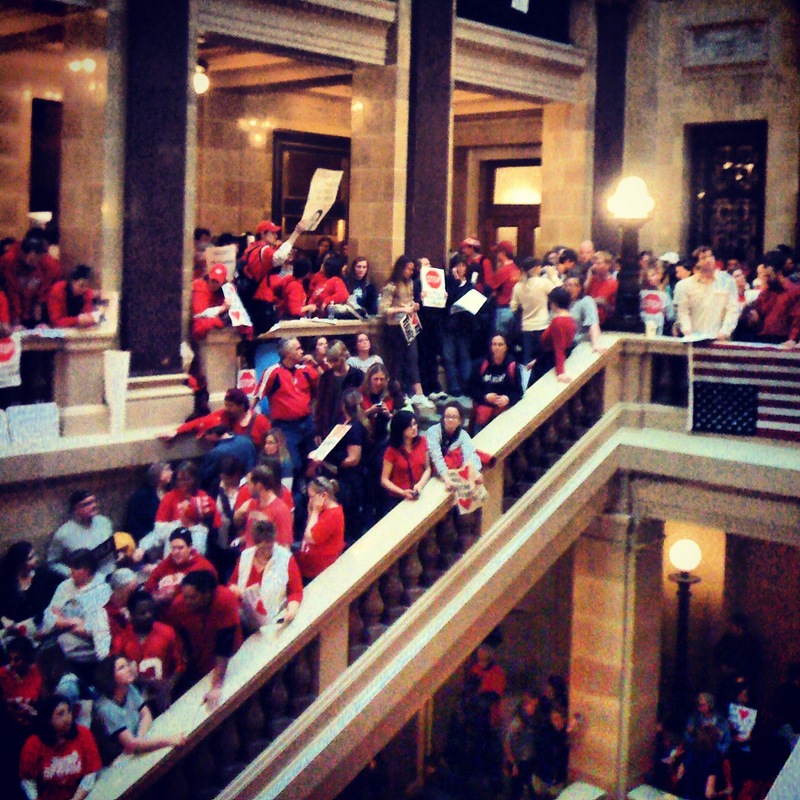 It is unlikely a state Capitol building would ever be mistaken for a sports arena, but on Thursday the Wisconsin Capitol building was rocking like the Kohl Center as thousands of people flocked to Madison to protest Governor Scott Walker’s controversial budget bill. The Capitol echoed with chants of “kill this bill” and “this is what democracy looks like,” loud applause, and the banging of drums. The loudest moment of the day occurred just after noon when it was announced that the 14 Democratic state senators had fled the Capitol, delaying a vote on the budget bill. If a vote is held, the bill will likely pass with ease as Republicans outnumber Democrats 19-14. But as long the Democrats remain absent, no vote can be held per senate rules that state 20 senators must be present. While most of the red-clad protesters were members of the public unions being threatened in the bill, members of private unions also joined the protests in solidarity. 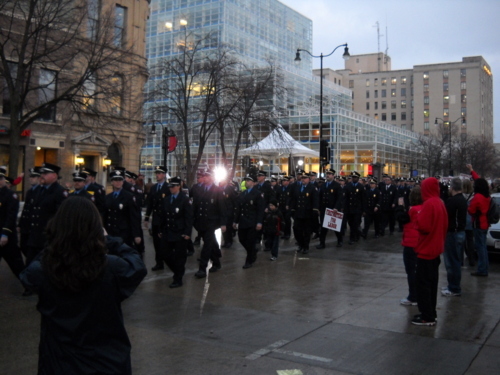 As night fell, over 50 uniformed members of the Madison Fire Department marched behind their bagpipe band down the streets surrounding the Capitol before entering the rotunda to boisterous applause. The protests also drew many high school and college students, most of whom had their classes cancelled as teachers across the state called into work sick so they could protest. Seniors Alex Dorn, Doug Krapf, Christian Foster and Connor Kelly of Waunakee High School wanted to support their teachers. “It’s been an amazing experience, so glad we came here,” said Dorn. For Dorn and his classmates, the bill also hit home. Dorn is the son of two state workers who are union members. “My mom is a teacher, I came to support her. She does so much for me and her students, it’s only right I try to do something for her,” said Krapf. “My mom is a state worker, and she deserves better than this,” said Foster. While Connor Kelly did not have any family members affected by the bill, he still had a strong opinion. The protesters are being heard loud and clear in the governor’s offices, said Patrick Roetker, a policy assistant for Gov. Walker. I wrote this story in Feb. 2011 for my advanced reporting class at UW-Madison. I’m covered the Sherman neighborhood of Madison, WI. Megan Maguire created excitement among Sherman Neighborhood Association (SNA) members when she walked into the association’s quarterly meeting in Dec. 2009. Maguire was the first new attendee at a SNA meeting in several years. Maguire continued to impress SNA members at the next meeting when she brought a neighbor with her. “They were floored. They thought, ‘not only is she new, but she brought someone with her!,’” said Maguire. Just over a year after attending her first meeting, Maguire now serves as co-chair (along with Lynette Jandl) of the SNA. Maguire first came to Madison in 1987 when she enrolled at the University of Wisconsin. After living in downtown Madison for nine years, Maguire moved to the Sherman neighborhood in June of 2000. Sherman became a target of her house hunting because she believed it was one of the only “decent-seeming” neighborhoods that had affordable houses. Maguire was surprised by the diversity of the neighborhood she chose to live in. “There is a truly amazing mix of average people. It’s a surprisingly eclectic neighborhood, much more so than maybe a lot of west side neighborhoods,” said Maguire. Maguire says that she first became active when she felt frustrated by Wiggies’s Bar, which lies just a block from her home. Maguire spent 18 months working with police and city officials in an attempt to stop the increased crime, noise and littering from patrons of Wiggie’s. In response to complaints from Maguire and other Sherman residents, Madison police imposed a comprehensive security plan on Wiggie’s Bar in Nov. 2010 that has led to dramatic improvements in the neighborhood. Maguire decided to join the SNA after reading a news article about the association in the Oct. 2009 edition of the North Side News. “They listed the date of the next meeting, and I realized I wanted to be more involved in the neighborhood as a whole, it seemed selfish to just focus on my little area,” said Maguire. In Jan. 2011, Maguire and Jandl were named co-chairs on the SNA, replacing Diane Brown who could no longer hold the position due to other obligations. While the other members of the SNA had been involved with the association for much longer than Maguire, they did not want to take on the extra responsibilities of being chair. Maguire was willing to give it a try, and according to Brown, Maguire is ready for the challenge. Inexperience has made being co-chair has been a bit stressful. Working along side the more experienced Jandl has been helpful for Maguire. “I think we are perfect compliments. I think I am the one that gets the ball rolling, but she is the one that makes sure the ball doesn’t veer off track. I could not ask for a greater person to work with as co-chair. ” said Maguire. Maguire spends three to four hours a week dealing with her duties as co-chair. Her main responsibilities include acting as a contact for the SNA and setting agendas for and running the quarterly association meetings. Maguire’s first goal as SNA co-chair is to expand the association’s membership, bringing in fresh faces with new ideas. The SNA received a grant from the city to increase membership through a mass-mailing and flyer distribution campaign. Maguire is hopeful that the grant will make more Sherman residents aware that the SNA is a useful, neighborhood resource. Brown believes her successor will be able to meet her goal. “I believe she will bring an infusion of new members or at least participants in information dissemination and discussions. I hope she will be able to encourage and involve people to assist with activities so SNA can make some progress,” said Brown. As co-chair, Maguire wants the SNA to work with police to address increased instances of random property damage and excessive speeding on Aberg Avenue and Northport Drive. Maguire also hopes the SNA can make the neighborhood a more desirable location to businesses, hopefully filling some of the empty spaces in Northgate Shopping Center and Northside Town Center. While being co-chair of the SNA has brought increased responsibility and accountability, Maguire is enjoying representing Sherman neighborhood and Madison’s north side. I wrote this story in March 2011 for my advanced reporting class at UW-Madison. I’m covered the Sherman neighborhood of Madison, WI. Almost a year after the controversy over Warner Park’s geese population began, Madison is still finalizing a goose management plan for all of the city’s parks. The Parks Division will hold their last goose management public informational and listening session meeting on April 20 from 6 p.m. to 8:30 p.m. at the Goodman Maintenance Facility. The final plan will be put up for consideration before the Board of Parks Commission in May, according to Parks Division spokeswoman Laura Whitmore. Madison’s quest to develop a goose management plan has been full of twists and turns. It all began on April 14, 2010 when the Board of Parks Commissioners approved a plan to kill 80 to 100 geese at Warner Park. The plan would have involved the first lethal measures taken against geese by the city of Madison. Representatives of Dane County Regional Airport proposed the plan. They believed the geese at Warner Park, located about a mile and a half away from the airport’s main runway, posed a threat to flight safety. In Jan. 2009, a flock of geese struck a plane outside of New York City. The pilot was forced to perform a “miracle” landing on the Hudson River. In response, New York officials approved a plan to kill 1,200 geese near the city’s main airports. “I think you’ve got a dangerous situation in there. I don’t want to test out another Miracle on the Hudson here,” said Ald. Joe Clausius, a member of the Board of Parks Commission, at the April 14 meeting. The plan was approved the same day it was proposed and no indication that a goose management plan would be discussed was given prior to the commissioners’ meeting. 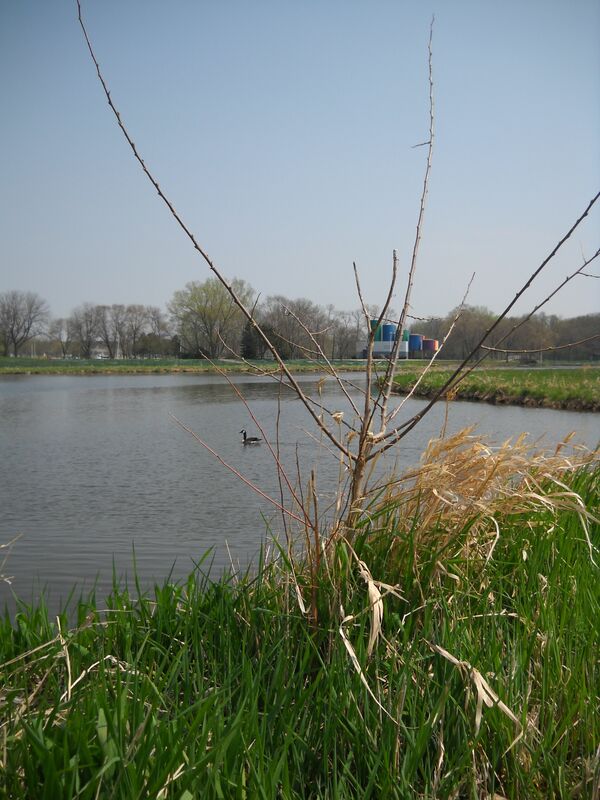 would be discussed, much less that it meant killing geese in the park,” wrote Ald. Satya Rhodes-Conway in an April 23, 2010 letter to the parks commissioners. The plan’s passage was immediately met with protest from Madison residents. A “No Madison Goose Kill” Facebook group quickly gained over 1700 members. Many believed that the geese did not pose as big of a threat to flight safety as the airport reported, and that there were alternative, non-lethal measures that could be taken to control the goose population. In response, the Parks Commissioners held a meeting on May 12, 2010 to receive input from the public. The meeting was well attended, and upset citizens spoke up against the plan, including Jim Carrier, co-founder of Wild Warner Inc., a non-profit advocacy group protecting wildlife in Warner Park. “Do not take all our geese. Do not silence our spring. Do not kill their call of the wild,” Carrier said in a prepared speech. After being presented with new information and receiving input from the public, the commissioners unanimously voted to put the plan on hold and vowed to develop a non-lethal goose management plan. “I think the Parks Department needs to think broadly to come up with a strategy. I think its a mistake to focus on just Warner Park,” said parks commissioner Betty Chewning. The commissioners said that they would look into numerous management techniques including habitat modification, egg addling/oiling and goose harassment. Wild Warner has made numerous recommendations, one being that Madison must start obeying their own no-feeding ordinance. The organization says that the city is feeding and attracting Canada Geese by continually mowing the grass at city parks. While the final goose management plan is still being debated, Madison has already taken one step to control its goose population. Last June, the city began killing goose eggs in Warner Park using a technique called “oiling.” 96 eggs were suffocated with corn oil. The Parks Division hosted two public forums last fall. An October meeting focused on golf courses, while a November meeting focused on general parklands. The birds’ potential threat to flight safety is not the only reason the city is developing a goose management plan. The high number of geese in Madison’s parks is also threatening public health. 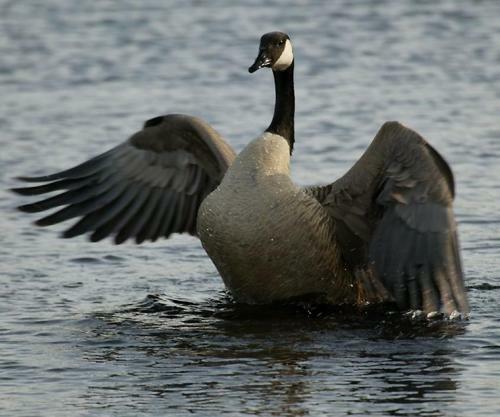 A goose leaves behind up to a half pound of waste a day. That waste contributes to elevated levels of E. coli, salmonella and cryptosporidium, according to the Dane County Health Department. Vilas Beach, the city’s most heavily used beach, was deemed unfit for swimming by the Environmental Protection Agency in 2008 due to excessive levels of E. coli, according to the Friends of Lake Wingra advocacy group. Five other Madison beaches were deemed impaired for swimming by the EPA. Geese have also proven to be a nuisance to park goers. “It would definitely be nice to have less goose poop all over the parks, but I don’t think its worth killing them over,” said Ben Daniels, a Warner Park regular. Goose waste often ends up on the city’s soccer fields, basketball courts and playgrounds, and on the bottom of people’s shoes. Wiggie’s Security Plan is Working, But How Long Will It Last? Three months after Madison police imposed a security plan on Wiggie’s Bar (1901 Aberg Ave.), residents of the Sherman Neighborhood in which the bar is located are noticing improvements. According to police reports, there have been no incidents at the bar since the security plan was put in place on Nov. 30. However, Maguire and other Sherman residents are worried that the security plan may be removed in May when the bar’s alcohol beverage license comes up for review before the Alcohol License Review Committee. “I anticipate the bar owner [David Wiganowsky] will try to have the plan removed. Many people have indicated to me they will be adding their input in support of maintaining the plan,” said Maguire. During a Sherman Neighborhood Association meeting in February, Wiganowsky stated his desire to return to the bar’s old operating hours in the near future. Since November, Wiggie’s has been closing between 8 p.m. and 9 p.m to avoid some of the stipulations listed in the police mandated security plan. Wiganowsky said he was losing too much money to be able to maintain his business with shorten hours. Mark Woulf, Alcohol Policy Coordinator for Madison, also believes Wiganowsky will try to have at least some of the plan removed. “It is likely that his license renewal will be separated for review in front of the ALRC, and it is also likely that Wiganowsky will ask for at least some of the provisions within the Chief’s security plan be removed from his license,” said Woulf. Attempts to reach Wiganowsky for comment were not successful. Maguire has been very pleased with the results of the security plan. She says the neighborhood is in much better shape now than it was just four months ago, and she fears that without the security plan the neighborhood would go back to how it used to be. Maguire, who lives just around the corner from Wiggie’s, said that she used to witness unwanted and illegal activity right outside her home. 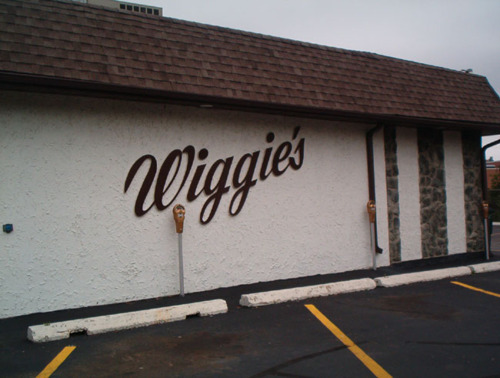 Police decided to impose a comprehensive security plan on Wiggie’s after a series of incidents last fall. On Oct 26., two women were sent to the hospital, one with a knife wound, after getting in to a fight in the bar’s parking lot. On Nov. 6, an unidentified person fired multiple shots outside the bar. The tipping point came on Nov. 8, when a 49-year-old man was arrested in the bar’s parking lot, and police confiscated a knife, marijuana and cocaine. Police finalized the security plan on Nov. 30, and the elements of the plan became conditions on the bar’s alcohol beverage license. As part of the security plan, the bar is required to hire two licensed, uniformed security officers to monitor the lot for problems. However, this is only required Thursday through Sunday after 11 p.m. According to Woulf, Wiganowsky has avoided hiring extra security by voluntarily closing the bar early. The security plan also requires the bar to: purchase an ID scanner; maintain and utilize a video surveillance system; maintain a log of all incidents, and share that log with police; post a notice of no trespassing or loitering in the parking lot; and prohibit loitering on the north or west side of the building. I wrote this story in Feb. 2011 for my advanced reporting class at UW-Madison. I covered the Sherman neighborhood of Madison, WI.